I was born in Quebec. At the age of 6 I was in a car accident that left me paraplegic. I lived in Montreal before I moved to Vancouver in 2004. I wanted to move to enjoy the mild Vancouver winters but also for work opportunities. I only completed grade 5 in Quebec but since I've been in Vancouver I've taken some computer training in hardware maintenance. I like to work with my hands, but being in a wheelchair can limit what I'm able to do. I accessed the Opportunities Fund program through a community case manager when I was looking for work. 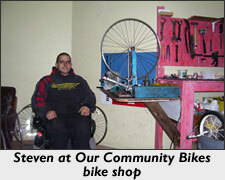 Using a wage subsidy, I was able to get training as a bike mechanic. Some minor workplace accommodations were made for me in the workshop (lowering my work bench, tools and bike parts). I was hired at the end of training as a regular employee. The Opportunity Fund wage subsidy program helps the employee with a disability to be integrated into the work area and enables employers to provide necessary accommodations.